A loo? What's that, a bog? A few days ago I wrote about the confusion us Brits can have, and cause, when speaking English in America. A friend sent me a link to an opinion piece in the New York Times that was published yesterday. I enjoyed it and hope you do too! It was announced today that the Caltech Submillimeter Observatory (CSO) will be decommissioned, although fortunately for those employed there the closure date is seven years away in 2016. The site will be returned to its former natural state by 2018. The reason for the planned closure, according to Caltech, is that a new next-generation submillimeter observatory called the Cornell Caltech Atacama Telescope will be built in Chile and will essentially supersede the CSO. 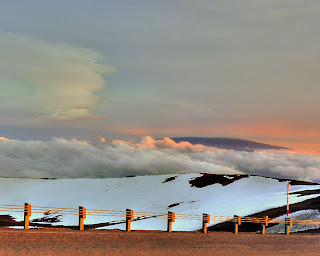 One of the older telescopes on Mauna Kea, the CSO is one of the first telescopes you see when driving to the summit and is often described as looking like a giant golf ball, although I don't really subscribe to the description. Unfortunately I don't have any really good close-up shot of the CSO, but the photo above was taken late last year on a very wintry evening at the summit. The CSO is the telescope at the bottom right with the dish pointing just above my head! I'm glad the observatory will be around for a few more years as there is some exciting science to come, especially with it linked up to the JCMT and SMA dishes to create the Extended Submillimeter Array (eSMA). News about GRB 090423 has been spreading rapidly throughout the astronomical community as it's by far and away the most distant object yet observed in our universe. This is the object we were the first to see from the Earth's surface. Press releases are being sent left right and centre by everyone involved in the follow-up observations after Swift first detected the burst. The image above is of the actual Swift observation of the GRB - courtesy of NASA/Swift. For those unfamiliar with the science, this was a gamma-ray burst. These are objects that are generally awfully distant, they don't occur in our Galaxy or in nearby ones (we might actually be thankful for this - you wouldn't want to be anywhere near such a violent event). The current theory, which is now supported by observational evidence, is that these were massive stars that evolved extremely rapidly in the early universe, as massive stars tend to do, and then died in a sudden and extremely violent manner when their hydrogen and helium fuel was exhausted. 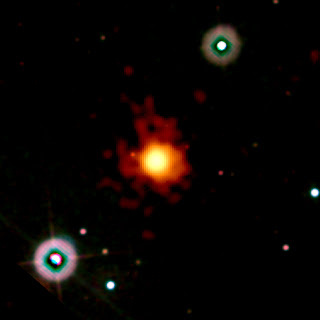 GRB 090423 probably left a black hole behind, but also shot some of the heavier elements out into space that our planet and we are all made of. This GRB occurred just over 13-billion light years away which means it's also taken that long for the light to get here. OK, so some might say it's old news, but there's little we can do about that. It does mean, however, that we observed an unimaginably energetic explosion that occurred when the universe was extremely young - current data suggest the universe is 13.7-billion years old - and observing events such as these will help tell us about what was going on back then and why the universe and our Galaxy are the way they are now. Oh, and perhaps explain why we're here as well! The Swift satellite detected the burst at 09:55 UTC April 23. The satellite then reorientated itself to observe the burst properly. Within a few minutes we got the alert that there was something going on, but our dome was closed due to high winds and cloud and at this point there was no indication of how distant this object was. We spent the next couple of minutes deciding whether we should risk opening the dome and then went for it. 5-minutes were spent opening the dome and setting up the pointing (calibrating the telescope so it and we knew what it was looking at), another couple of minutes focusing and then we were taking data. Twenty minutes after the initial detection from a satellite in space we were imaging the object at around 2.1 microns (that's in the infrared) - in 50-mph winds I might add! Our observations confirmed the position and showed that the object was extremely red which meant it was almost certainly very distant. Having done our job we let the other telescopes take over! The other day I mentioned that we may have observed the most distant object in the universe so far. Well, it's been confirmed and the story has made the front page of the BBC news in "Cosmic blast sets distance mark". It's definitely a nice feeling to be the first to detect such a distant object from a ground-based observatory and to do it so quickly after the initial discovery by the Swift satellite. The object has a redshift of 8.2 (a distance of just over 13 billion light years) and blows away the previous redshift record. The press release has more details: "New Gama-Ray Burst smashes cosmic distance record". ...why computer set up instructions these days are on the PCs hard drive, so you've already had to set up the computer in order to read them? This particular computer company's excuse is that they're going green so all the documentation is electronic. So why do I have so many shrink wrapped paper documents written by lawyers instead? Yes, the new computer is working, fortunately I have a few brain cells left to figure things out for myself, but I pity anyone who's never set up a PC before and buys this thing. Oh, and it's only crashed once today. Things are looking up. Well, it finally happened, my old PC died on Saturday morning. No matter that it had the processing power of a couple of ostriches and the memory equivalent to an alcoholic the morning after a binge, I had grown quite attached to it. It lasted seven years without any major problems which is pretty remarkable in this climate. So, long before planned, I bought a new PC yesterday and have been busy since then trying to recover what I can from the old PC. Luckily my photos were all backed up on CDs but it's a long and slow process getting them onto the new computer and still being on a dialup means that things I can't recover take an awful long time to download. Then there's updating the new antivirus software and these stupid windows updates. Worst of all, I'm now dealing with Microsoft's Vista operating system. Jeeze, what a piece of crap. I was hoping to delay things long enough to "enjoy" their next operating system. Maybe I should buy a Mac next time. The good news, however, is that the DVD/CD drive on this new machine was actually able to read files off a damaged CD. It contained hundreds of photos from last December which I thought I had lost, but I've managed to recover something like 80 to 90% of them. No other drive I tried could do this, so at least on this score I'm a happy camper! The image above is one I thought I had lost. It's in fact three photos combined into one using Photomatix. Although at the time I took the shots I had little idea what I was doing, the scene looked so wonderful I just had to capture it. Now with my photo editing software running on a new machine and I don't have to wait hours to see the processed result I think I might just enjoy the experience of a new PC. That's if Vista doesn't crash. It's done so twice already in 24-hours. I can't remember the last time the operating system on my old PC crashed. Anyway, the picture above is of Mauna Kea's shadow at sunset before the really bad weather hit this winter (in fact it snowed soon after this shot - photos to come later). Taken from roughly the same place soon after the shadow, the picture below is of the UKIRT . It seems one or two people had the same idea as me and were trying to get that sunset shot! PS. Apologies for not replying to comments recently, but the PC was getting rather sick last week so hope you don't mind! Bathroom, restroom, toilet or loo? Whether you're in them or on them, it's the last place you want to be during an earthquake. English to American translation becomes important in situations like these, but more about that in a bit. If you're a tourist at the summit of Mauna Kea, you can always relieve yourself off the summit ridge, just don't let anyone catch you doing that. I lived in the UK for nearly thirty years and was and still am quite patriotic about the place despite it going to absolute hell in recent years. Now I live in a relatively small island, despite its name, in the middle of the Pacific Ocean. In the last three days I have experienced everything that makes me want to continue living here. 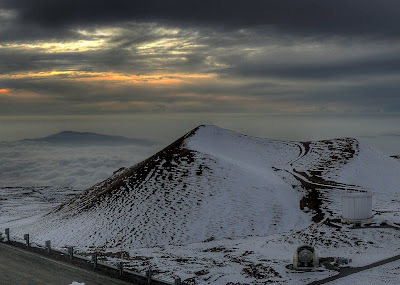 In those 72-hours I've experienced an earthquake, near-hurricane force winds, freezing temperatures, ice, snow, a drive up to the summit of Mauna Kea that'll test even the best dentures even in a well-equipped 4-WD and views that'll knock anyone's socks off. (We may have also detected the most distant object yet observed in our universe during all the excitement - by a long way. Or it may be something much more mundane - more later. It'd be quite cool if I was the observer that for a short period of time looked back further in time than anyone else on this planet! People will look back in history and say "Oh yeah, he's the guy that looked back in time further than anyone else and was confused about bathrooms and toilets."). Driving back home today from the mountain I experienced heavy rain, thunderstorms, flooding and finally when I got home, a forecast of flooding rivaling biblical proportions that we'd be getting in the next day or so. To make it worse, the forecast says it'll be just great on Sunday and Monday and then make sure you have a boat or at the very least a life vest for the middle of next week, as the rains will start again. So, back to the bathroom business. Those that live on the windward side of the Big Island will know we had another earthquake on Tuesday. It wasn't huge, but it was felt all the way up at 9,000-feet on Mauna Kea. It wasn't a jolt, it was a slow swaying that got stronger, then levelled out for a bit before weakening and then stopping, but the swaying went on a bit longer than normal. Those that live in earthquake zones know the rules, dive under something solid. What do you do if you're sat on the toilet in the bathroom with your pants around your ankles? Do you dive under the doorway because that might be the safest place in the middle of a large dormitory with dozens of other people staying there, or do you just continue to sit on the loo and hope that if the building collapses your rescuers will understand? Actually, it wasn't that big an earthquake, but since I was occupied in the restroom at the time, I wondered what the official advice might be. HP residents, at least those I told, looked a little puzzled when I asked them what I should do when I was in the toilet and it starts to shake. Well, not down at sea level, but at 14,000-feet and with winds approaching 50-mph the windchill is unbearable. I don't mind the cold normally, but it was a maximum of five minutes spent outside with the camera before coming back into the control room with painful extremities. Since then, we've opened up the dome for 30-minutes as we had an urgent observation to do, but closed again as the wind became even stronger. Yet another frustrating night in this continuing period of weather from hell for the observatories at the summit. Still, my friend the lenticular cloud was still there this evening, although judging by the comments people think it's more likely an alien spaceship from outer space, but of course the government doesn't let me comment on that sort of thing in case I might give the game away. Yesterday evening the cloud was still massive although very difficult to see. A grey/white cloud against a grey/white background. I tried the HDR technique again and it brought the cloud out in the picture above but does make everything look a little 3-D! This evening, though, the cloud is tiny and is hard to see in the picture above - it's at the extreme centre-left. I could have tried to zoom in a little, but I had spent enough time outside and to avoid losing my fingers to frostbite, headed back inside for the night. On the drive up to Hale Pohaku this morning I saw a large lenticular cloud over Mauna Loa, but it was still far too dark to take a picture. 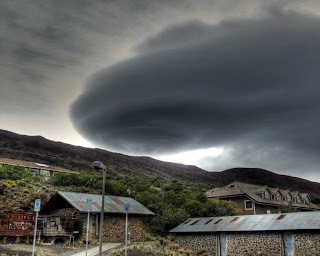 After an early breakfast and before heading to my room to get a few hours sleep, I took a picture of the cloud over Mauna Loa and one also of a lenticular cloud over Mauna Kea. 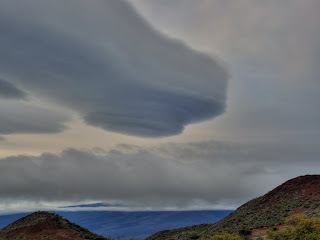 These types of clouds often form in mountainous areas when there are high winds at summit level. Tonight we can't open the dome as the winds are still too high. The humidity has been rising as well, so we may be in fog soon although the sky above does appear to be clearing. Another frustrating night on the summit. 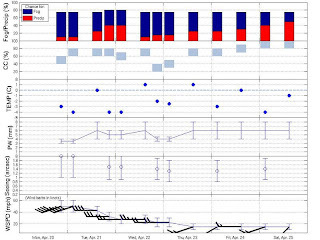 Winter nights observing on the summit of Mauna Kea are real killers. We have a rule that no-one is allowed above the 9000-ft level for more than 14-hours and this is partly safety-related and partly to keep our telescope operators and other observing staff sane. Winter obviously means longer nights and in some circumstances you have to add on a few hours for the time spent preparing for the night. 17 and 18-hour work days are not uncommon. 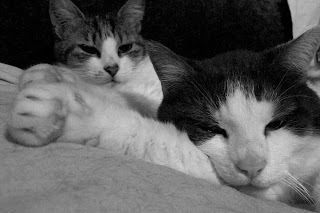 We're human, we need to sleep. On the other hand, I'm having a hard time recalling the last full night I spent at the summit in recent months. The weather has been so bad that we've given up in the early hours or have been forced down to lower altitudes due to dangerous conditions. Forget that we now have shorter nights, this past winter has seen to it that everyone's been pretty well rested - if you can sleep at Hale Pohaku that is. I'm heading back up to the mountain tonight to prepare for a couple of nights observing and the forecast is awful yet again. The summary above says it all, but for those unfamiliar with the MKWC's forecast summaries, any blue or red in the top part is bad. They signify the chances of fog and precipitation and in good weather you won't see any colours up there. So will I take a few more sunset photos? I'm not sure, it may well be foggy up at the summit, but we'll see. It'll also be very windy. That combination means 1) holding a camera steady might be difficult, 2) fog at the summit isn't often photogenic and 3) it'll be bloody freezing. So much for my new obsession with HDR photography! No matter, I'm still going through old photos and seeing what this HDR technique will do. Here are a couple of examples, before and after. You can decide if the second image is better in either case. 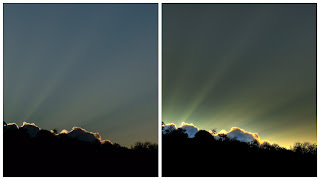 As for me, I like the HDR image in the first pair, but am not sure about the second pair. The HDR software also brought out the sea spray spots in that last panorama! Something more difficult than herding cats? Taking a portrait photo of a cat is something I'm starting to learn is one of the hardest things in photography. I'm trying to cram my brain full of technical stuff: What aperture to use? Should I overexpose? How exactly should I frame this shot? Where's the light coming from? How do you clean seawater off a lense? You think the cat is posing perfectly and then just as you take the shot she puts her paw in front of her face. Don't ask me what she's doing with her leg but her eyes have spotted something. Then, just as she removes the paw and you think you can take a decent photo, she dives down because something has taken her interest, and why was my camera almost jerked out of my hands? Oh, that'll be it. The photo is out of focus because Bubbles has decided to attack the camera strap. Having someone tug on your camera makes it a little difficult to get the framing and focus just right. The solution, some might say, is to step away and then zoom the camera in from a distance, but this doesn't work because she'll just jump down from the desk and follow me, especially with a camera strap to play with. Finally, after all the fun, it's the "what, you wanted me to pose?" look. "I would have done this earlier if you told me". Jeeze. Eddie is even harder to photograph. 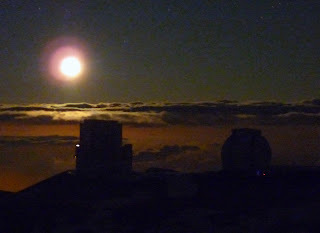 The e-astronomer is currently observing at UKIRT on the Big Island of Hawai`i. Well, perhaps observing isn't the right word because he's now getting first hand experience of the dreadful last few months every observatory at the summit has been experiencing. Tonight the sky is actually clear, but now the winds are too high to allow UKIRT to open the dome. Similar to most observatories around the world, there is a wind-speed limit above which the dome has to be closed for safety reasons. Talk about frustrating, but there have been many of us in the same position recently. The only good thing about the weather is that if you're at the summit you stand a good chance of seeing a sunset similar to the picture above. I received an interesting email recently. It contains hearsay so don't take it as The Truth, but a member of the MKWC team recently answered a question posed about why the recent weather has been so bad. The answer, it appears, is that we are currently experiencing La Nina conditions - this is the opposite to the more infamous El Nino. Jan 09: La Nina in full swing. Oops. Models predict La Nina will last into the summer of 09. Feb 09: models predict a weakening La Nina in Feb to Apr and gone by the summer. Mar 09: La Nina conditions persisting, models predict an end somewhere between May and July. Apr 09: La Nina still here, should be gone by the end of June. It turns out I screwed up. I claimed in my last couple of posts that the images there were HDR photos. That's only half true. They are HDR images but there was another step in the processing I missed out. Something called tone mapping. Sorry. I really am learning about these things as I post stuff, so don't be surprised if I've missed something else out as well. I'm going back over several pictures that I think I can improve quite dramatically now that I've got a better idea about what I'm doing. I'm glad I'm friends with this guy because things started to click in my brain today after we had a long chat about photography. Incidentally, "Kauai Land, Kauai Water" contains some stunning photos. It was also fun to listen to the stories behind some of the pictures! Well, here's another attempt at creating an HDR image, and all I can say is that the sky looks absolutely stunning. Shame about the JCMT and CSO looking a little fuzzy, but they won't mind. Still, I'm impressed with the images that can be taken with a $200 camera and some free software, but am learning, slowly, that a tripod is perhaps the most essential piece of equipment for taking decent landscape pictures. As I age it's becoming more difficult to deal with shift work. It'd probably be easier if the schedule was regular but it isn't. So, after nights spent at the summit I wake up at 4am after hitting the sack a midnight, and then a few days later I go to bed at 10-pm and still can't get going at 7 o'clock the next morning. It's like jet lag with the additional problem of spending time at 14,000 feet. It has unpredictable effects on your body and mind although I wouldn't give this job up for anything! This morning was slow and when I finally got my brain working I looked outside and realised it was sunny but the rain was pounding on the roof. Those are the perfect conditions for rainbows so looked to the west and sure enough, there was a particularly bright rainbow over my neighbour's house. Grab camera, go to the upstairs lanai, take a few shots. It's almost automatic these days. This evening when the sun was setting the clouds looked amazing, so repeat the process. Same spot on the same lanai, just zoomed in a little. I really wish I could paint because this second picture begs a painting. These pictures were actually my first attempt at creating high dynamic range (HDR) pictures. The technique is to take three or more photos of exactly the same scene but with different exposure times (exposure bracketing). This results in images which have both the bright and dark areas exposed correctly (although not in the same pictures), and then all those images are combined in software to create a picture that you couldn't create taking a single photograph, but does look more like the way your eye see things. I've been doing exposure bracketing for months now but didn't have the software to process the images properly. Now I'm trying a couple of free programmes to see what they can do. If they work well I have hundreds of pictures with potential - I might end up being quite busy in my spare time! The other night I was woken by a phone call in the early morning - such is life when 1) you live in a timezone that contains a tiny fraction of the world's population or 2) you work at an astronomical observatory. While taking the call I noticed bright moon light shining through a window right onto the girls' current sleeping quarters, so I couldn't help it, after the call I took a couple of pictures. Is Bubbles giving me the finger for waking her up? PS. (Cryptic message of the week): Thank you, TimJ, for making my day today! 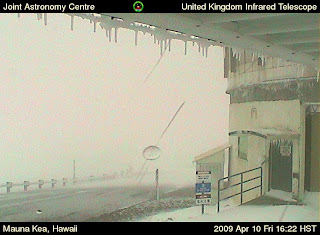 It's likely that the heavy snowfalls on Mauna Kea's summit are over until next winter, although I have known it snow in July! There's still plenty of ice and snow at the summit and until the sun moves further north in the sky it will remain in places shielded from direct sunlight. Even in those areas the ice is melting as daytime temperatures rise to well above freezing. At night, however, the temperature drops again and the melting ice refreezes, leading to some odd-looking effects. What an interesting day. I'm supporting the current observing run at the telescope and partly as a consequence didn't get to bed until midnight and then woke up at 4-am completely wide-awake. Well, I had an early start planned anyway, just not quite that early. Today we worked on infrared array electronics at the summit trying to narrow down a fault we've been seeing for a while and I think we got somewhere, or at least have a better idea where the fault is occurring and can now plan some further tests and hopefully fix it very soon. In the middle of all this we had an earthquake. I thought at first I was dozing off as it was just after lunch, but the building really did shake. Fortunately nothing was damaged, but the guys up on a crane at the top of the dome certainly experienced a nervous few seconds - those Genie cranes certainly amplify any ground movement! It was also my first photo assignment. Well, not a real one, but one of the scientists I was up with today needed some photos taken of him at the summit for an article in his local town's newspaper - a very small town way up there somewhere in the Italian Alps. I was happy to oblige as he's such a great guy, but learned that I'm a bit better at photographing landscapes rather than people, but hopefully there are one or two decent photos the paper can use. In a short break today, however, I took a few photos of the observatories at the summit. I didn't really want to do this: the sun was high, the sky was bright, all the clouds were way below us and the snow was making exposure times difficult to sort out, but I took my camera up there so goddamn I was going to use it. Keck II, with a really funky shadow from the walkways on the dome. Now those are places I would not want to be during an earthquake. Keck I with the dormant volcano Haleakalā on the island of Maui in the distance. 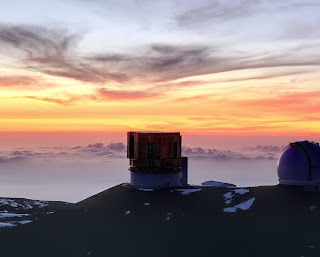 Like Mauna Kea, Haleakalā has astronomical observatories at the summit, but being almost 4,000-feet lower at 10,000-feet doesn't offer quite the same astronomical image quality as Mauna Kea. It's a great place to watch sunsets and sunrises though and is much more accessible to the general public as there's a decent paved road all the way to the summit. 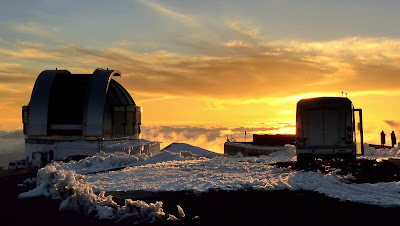 The Canada-France-Hawaii Telescope (CFHT). This is the place that did the Hawaiian Starlight movie. Get it if you can! Finally, the Gemini North Observatory. I worked there for a while although it was in a kind of shared mode (I helped commission an instrument there). The dome dominates the summit ridge and there's one amazing telescope inside! Living on the east side of an island doesn't typically lend itself to being able to take nice sunset shots, especially when there are two 14,000-foot volcanoes in the way and the trade winds pile up low-level clouds against those mountains. Occasionally, though, we do get some spectacular sunsets. This evening was one example although I can't remember the last one! I almost missed it as well. I just happened to look out of the window at around sunset and saw the most spectacular sky. 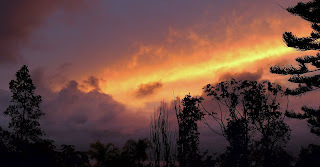 So, no tripod or filters, just some snapshots in an attempt to capture the amazing colours from my lanai and garden. 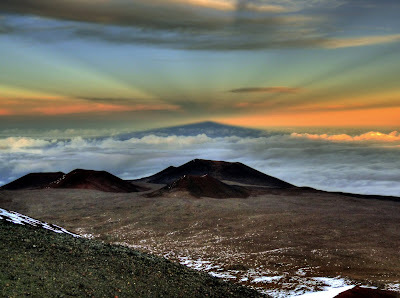 According to the observers I spoke to at the summit of Mauna Kea the sunset from up there was amazing. I wish I'd been there to see it although I've seen my fair share of sunsets and sunrises from the mountain over the years! Well, I'm up there again tomorrow but not on the night shift this time, I have some work to do during the day. I'll take the camera but am not sure if I'll have time to take any photos. We'll see though, but it's time to hit the sack as it's an early start tomorrow morning. Looking to the north-east from my top lanai. Out on the dirt road looking north. From the lanai again. I love the trees but they get in the way sometimes! Back out on the dirt road taking a picture over my neighbour's house. I hope they didn't mind. 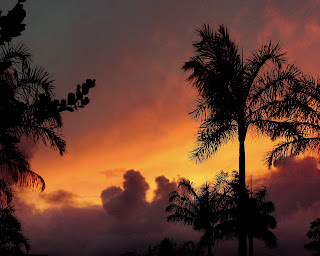 Same place, but the usual Hawai`i photo of palms at sunset. No ocean or beach I'm afraid! While on vacation in February/March I bought a couple of photography magazines because I wanted to see if they were worth subscribing to. One of them, a UK publication, was really good but I won't be buying it - I'm on the other side of the planet from the UK, the US-UK exchange rate isn't so good right now and what offers they did have were only open to those in the UK. That's fine, I subscribed to a couple of other US ones, but the UK magazine had an article about publishing photo books and it caught my eye - so much so that I've now created a book with my favourite photos from this blog. I used Blurb which has some software you can download in order to create your own book. It was fun although the book is private and will only be sent to my mother in the UK (and a copy for family in Austria) and the Treat Lady. I've ordered a couple of copies for preview and if they look good I might just consider letting others have a peek. It'll be nice to see my photos in print, even if I'll be the only one to see them! Anyway, we'll see. When the book/s arrive I'll let you know if the service is worth it. It's always nice to come back home after being driven off the mountain by a blizzard and life-threatening weather. You get to see your loved ones again who simply explode with excitement and enthusiasm at your return. In an article many months ago I think I boasted about how clear the night sky was from my house. I can't find that blog entry now, but regret writing it because since then I can't recall the last clear night - at least from down here at sea level. The photo above is from late February this year when I was trying to figure out how to take night-time photos with my camera. Even then the sky wasn't completely clear, but at least the stars were visible with Orion overhead. Since then there has been no clear night. Not one. What's going on? When I first moved here it seemed that every other night I could walk out the door and be met with an incredibly clear, dark and star-filled sky. It usually took seconds to spot the Andromeda galaxy, it was that dark. 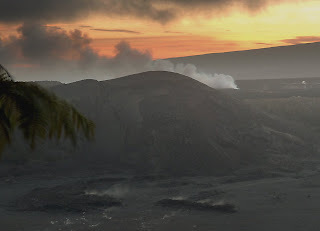 Inclement weather at the summit of Mauna Kea on the Big Island of Hawai`i continues. Yesterday evening our telescope operator, a couple of visiting observers and I ventured up to the summit at 5:30pm in the hope of at least checking the dome, getting in a little bit of training (this was one of the observer's first visit to Mauna Kea - welcome to Hawai`i!) and getting a brief glimpse of the sunset. Well, we didn't really get any of those done as the weather was appalling. We drove the "scenic" route as we like to call it, it takes us past all the telescopes on the summit, but we could hardly see any of them until we were right next to them. Thick fog, high winds and snow made for almost white-out conditions. We described it as blizzard-like in the night log because that was the most appropriate description. The road was already covered in thin ice and the snow was starting to form drifts. It was clear we'd have to evacuate almost immediately or risk the road becoming impassible leaving us trapped at the summit. That's not a pleasant thought. The weather was so bad there wasn't even a chance of taking a photo outside, standing upright in those cold winds was difficult enough without holding a camera steady as well. Believe me, anyone stuck up there without the right gear or access to shelter (i.e., the observatories) would have been unlikely to survive the night. So we came down almost immediately. 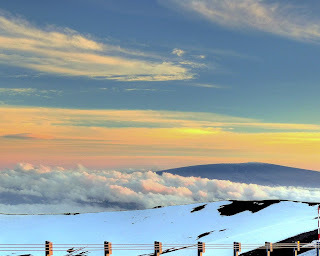 The forecast is for these conditions to continue for another day or two at least and today the Mauna Kea rangers reported large 5-foot drifts in some places, ice on the road and heavy snowfall, so the road was closed. The snowfall was so heavy that the snow-clearing crew were beaten into submission, snow was accumulating faster than they could clear it! Since I couldn't take any pictures I've used a webcam picture of the summit taken late this afternoon at UKIRT. It was the clearest view of all the summit webcams but doesn't give justice to the conditions. The high winds were blowing all the snow off the road at this section but piling it against other sections not visible in the shot. It really is not a place to be at the moment. 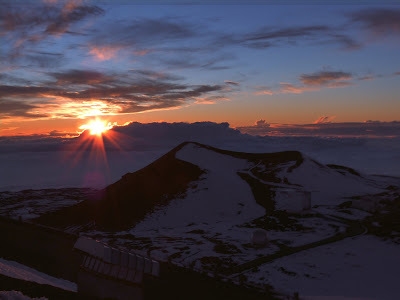 In the meantime, happy Easter everyone and give a thought to the Mauna Kea Observatories Support Services (MKSS) snow-clearing crew. They will be up again on Easter Saturday trying to clear the road. I don't envy them. Reading my few photography books has left me a little shocked. Now, they don't all say this, but one or two suggest using photoshop or similar software to use a bit of one image and copy it onto another to make it look better. One example might be taking a nice photo on a cloudy day and then adding the blue sky from another photo to make it look great (or sunny). Don't get me wrong, I knew that this could be done, I just hadn't realised that it might be normal advice given to a photographer. I really like to capture images and present them the way they looked to my eye and although I tweak the odd one, OK, crop them massively because I don't know how to compose and frame an image to save my life, I was somewhat surprised to see this suggestion given out so freely. 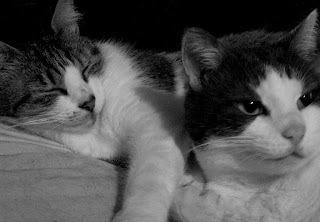 Then I realised that photography is an art form for many and so what if the photo is manipulated? Presenting a good picture is what it's all about. I'm no artist though, so still like to show what I see. It's also much easier doing it that way! Still, being a scientific type, I wanted to experiment, so I did. My computer isn't up to running photoshop or lightroom or any really serious photo editing software, but I saw something called PhotoPlus for sale at $10. It had the crucial thing I was looking for - layers - so I bought it. Now, for anyone out there thinking of doing the same thing, I really don't recommend buying PhotoPlus. It's OK, but you'll tear your hair out reading the manual and will likely put your fist through your monitor. It's hard, though, to feel too annoyed since it only cost ten bucks. I'll fast for a day or something to recover the expense. Oh yes. I wanted to try and copy a nice sky onto a picture with land. 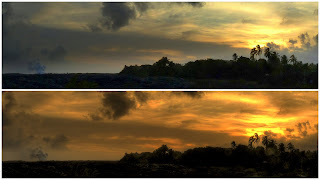 So I picked a couple of Kilauea Iki pictures I took that either had the land exposed properly while the sky blasted out and one where the sky was fine but the land was too dark. After repairing a couple of monitors and bandaging my fists, the result was the image above. It could be much better, I'm sure, and those that are keen will easily spot where the manipulation occurred, but it was interesting to see what you could do with the two poor photos below. I didn't realise it when I first moved into my house, but being quite close to the ocean on a peninsula meant I was in the Puna sun belt. Often, when the trade winds are blowing and the atmosphere isn't too wet, most of the windward side of the island, at least the Hilo and Hamakua regions, will be cloudy and damp yet it's sunny at my place. Drive a mile inland and it's raining, sometime heavily. 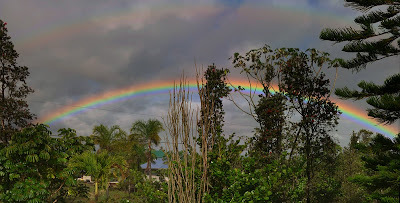 Today was a perfect example: at the office in Hilo it was cloudy and wet, but while driving home noticed that it looked clear towards the ocean and when I finally arrived home (damn the traffic on H-130) the sky was beautiful. Perhaps my last chance to spot a whale this season? No such luck, no whales and since I'm heading back up the mountain tomorrow, and the weather forecast is dire for the next week (that figures), I think I'll give up on the whale watching attempts until next winter. One day I'll get a picture, I swear, although I may have to resort to a whale watching boat trip. It's an a`ama crab, or Hawaiian rock crab, and I can tell you that these little buggers are downright difficult to photograph. Firstly, they're quite black. Secondly, they live on even blacker lava rock. Thirdly, they live in the splash zone, so you risk getting wet or swept off the cliffs if you want to get close, and fourthly, the little buggers have radar and scatter as soon as you get within twenty feet, usually over the edge of the cliff. PS. No tripod was used, abused, harmed or otherwise mistreated. 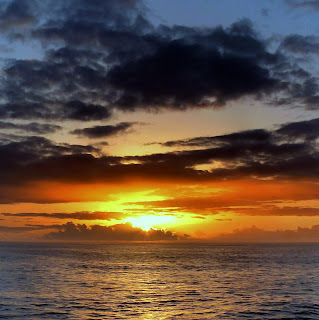 Yes, it's possible to take ocean panoramas without a tripod, but you have to be ever so careful! Just don't inhale and exhale very much and wait for the big waves to pass by. The last year has not been a good one for just about everyone due to the severe worldwide economic crisis. British astronomy has not been immune although the current funding crisis appears to be unrelated to the recession, more a chapter of mismanagement in the relevant research council. It's been difficult to keep up with all of the developments being so isolated out here in the middle of the Pacific Ocean but nevertheless everyone working here has been very nervous about their futures. Although I'm no cosmologist so certainly won't attempt to explain the science, there has been a very recent casualty of the crisis in the UK: the CLOVER project. This would have been world-beating science and hopefully would have answered some of the most fundamental questions in modern astrophysics and cosmology, specifically the existence of gravitational waves in the early universe predicted by cosmological inflation. What has struck many, and an issue that we have been aware of for some time now over here in our small part of the Pacific, is how UK-only funded projects are so vulnerable to cuts and closure by the UK funding agencies. It seems to be the highest irony that good science is more susceptible to be thrown into the trash by the UK if it's a UK project. The reason for this, of course, is that if there are agreements with international partners then closing a project is much harder to do. Our observatory is funded almost exclusively by the UK, so I'm sure you can understand why people here are nervous. Both Andy and Peter have blogged about the recent problems. Andy had a guest blogger write "Over for Clover" and Peter wrote "Clover and Out" (among other posts). The comments in both posts are interesting reading as well. Hence the reason I've been practising my photography. Firstly, it's a release from the stress of having an uncertain future and secondly, if I practise enough, perhaps I can become professional and earn my living that way! Seriously, becoming a pro is not something I'll do, I'm nowhere near talented enough, but taking pictures does seem to release a little tension. So, I'm subjecting you to more photos from the backyard. 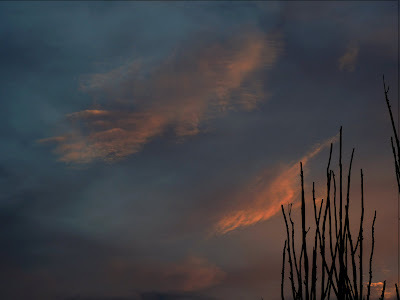 They were taken this evening after the first really sunny day I can remember for ages so tried to capture the colours of the few clouds that were around at sunset. 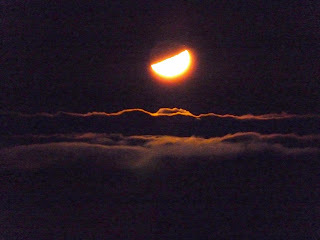 Oh, and the moon was up as well. I really like the last one. Not that it's a particularly good photo or anything, it just looks as though it was painted. Perhaps that's my next hobby? I don't think these are particularly good photos, but then again I suspect few people get the chance to take pictures like these - the moon setting above the clouds! I loved the reflection of the moonlight on the tops of the clouds and tried to capture the moment, although I have to remember to stop using higher ISO settings on my camera - they just add too much noise. The day after I took these photos and headed back to sea level and oxygen I found the Hawaiian Starlight DVD in my mail. I ordered it after reading the article by Andrew Cooper called "Hawaiian Starlight DVD Available". It's very special. Amazing movies from the summit of Mauna Kea coupled with pictures of deep sky objects and great music. You'll get to see where Andrew, Ant and I take some of our pictures and that we're not faking things - the colours at sunrise and sunset on Mauna Kea really are incredible. Apparently the DVD is not available in Europe right now but will be next month. For my European readers, please buy it when you can, you won't be disappointed. For those in the USA, it's available from the CFHT Hawaiian Starlight site and worth at least double the $15 it costs.